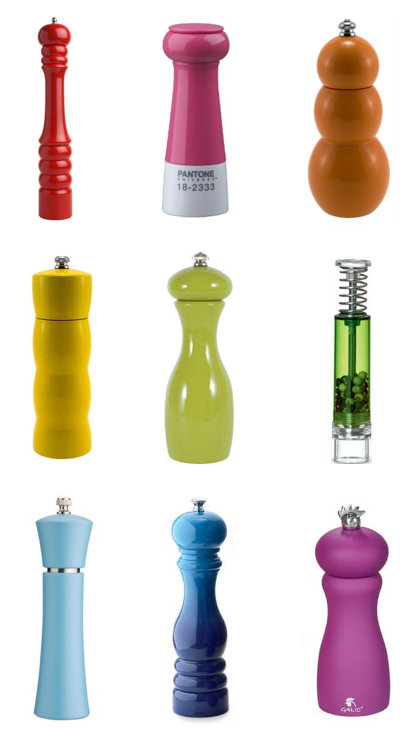 A Rainbow of Pepper Mills! I have a bright red pepper mill from Anthropologie that I love. However, after a few years of some serious cooking and a few chips in the lacquer it could use to be replaced. I really like the Henrik Salt and Pepper Mill from Crate and Barrel right now, so that’s the likely replacement: far from bright red, but interesting for the shape alone. Pepper (or salt) mills are a great way to add some color to your kitchen on the cheap, and it’s fun and easy to start a collection of them. Displayed or not, you’ll have fun knowing your pepper is coming from a beautiful gadget as opposed to an institutional shaker. Enjoy the hunt, don’t be afraid to have more than one, and let me know if you find a great one! ← Find of the Week: Crayola Candy Canes! Ohh- I want the red, the yellow and the orange! What else can I grind besides Salt and Pepper? I change my mind I want the green spring loaded one. and the pink Patone one. Oh hell- just tell me where I can buy all of them.